Home › Bibliography › Ken Gonzales-Day and the Art of the Die-In. Ken Gonzales-Day and the Art of the Die-In. JSTOR/Daily,17 Apr. 2015, Los Angeles. 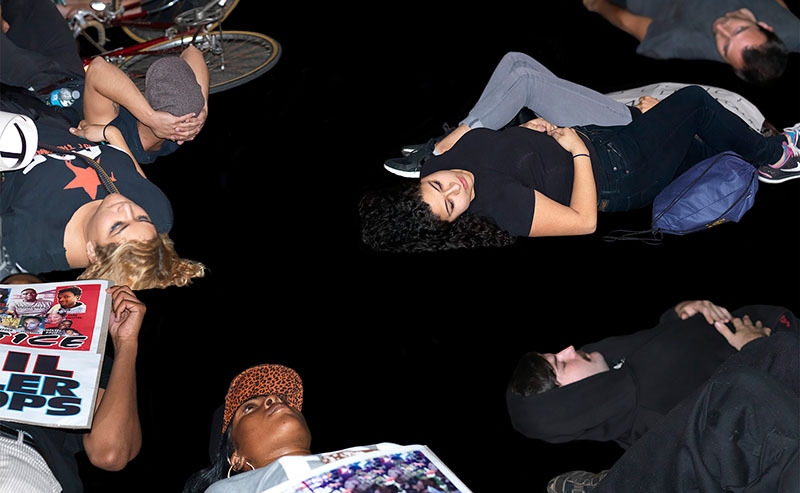 “In this WNYC interview, art critic Deborah Solomon names die-in photos the best art of 2014. Since the deaths of Michael Brown and Eric Garner, people across the U.S. have been staging die-ins to silently protest the deaths, subsequent acquittal of Darren Wilson, and non-indictments of the NYPD. Protestors use their physical bodies as both a stand-in for the victims’ bodies and a jarring reminder of lives lost. Artist Ken Gonzales-Day also saw the power and potential of these raw protest photos, in using them as source photos for his own art. In “Run Up” at Luis de Jesus Los Angeles, Gonzales-Day appropriates and manipulates his own photos taken from protests in Ferguson and LA and combines them with his own conceptual art to visually trace the roots of our political unrest. Emphasizing collective violence and resistance through mob mentality, police presence, and protests, Gonzales-Day ties present-day racial tensions to a lesser known history of lynchings. ‹ Gonzales-Day fills the holes of history.